We love the #GirlsWithToys hashtag derived from a rather sexist comment regarding women in STEM fields. Denver Comic Con had a Women in Comics panel without any female panelists. Really? Tana French’s Dublin Murder Squad book series will be coming to a TV near you. A “fantastic adventure set in an alternate 1900s Asia”? Sold! We’re looking forward to this comic from Marjorie Liu and Sana Takeda. The older actresses portraying the motorcycle tribe Many Mothers in Mad Max: Fury Road did their own stunts. Yes! Bill Nye’s inspiring speech at the graduation of Rutgers 2015 class. Toy Like Me is a project launched by mothers to create dolls to give better representation of kids with disabilities in the toy industry. Remembering author Tanith Lee, who passed away Sunday. Tor.com review for Sisters of the Revolution, an anthology of feminist speculative fiction. 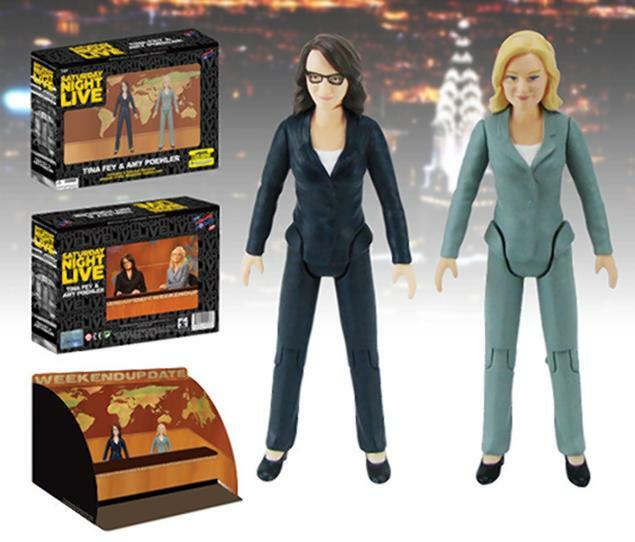 Now you can have your own figurines of Amy Poehler and Tina Fey on the Weekend Update set! Things we covet: The Tempescope, a device that tells the day’s weather by recreating it inside a cube. Facebook now allows GIF posts! Finally!